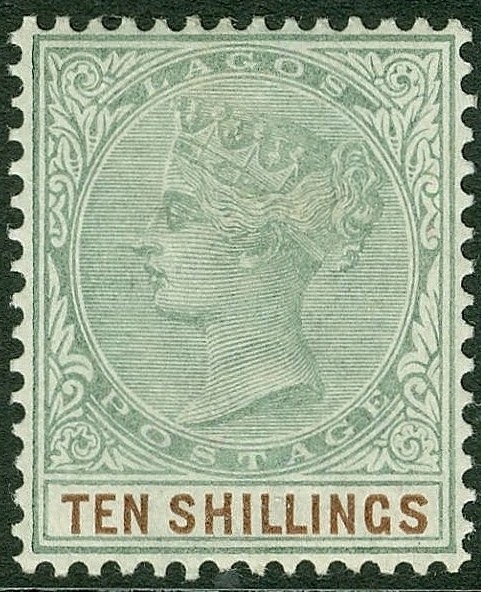 From 1882-1902, Lagos, a British Protectorate which later became part of Nigeria, issued a set of twenty six stamps picturing a young Queen Victoria for Lagos (Scott #13-38). The Scott Catalog doesn't treat this issue as a set, because there were at least two types of many of the stamps issued. 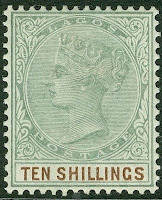 Many of its stamps are quite undervalued, and one could do worse than attempting to form a small specialized collection comprising the set, its varieties, covers, etc.. I've listed those stamps from the set with issuance quantities known (or quantities remaining after supplies were destroyed by postal authorities) of 100,000 or less, and included the Scott '14 values for unused. Based purely on the growth of demand from British Commonwealth collectors, this set and its scarcest values (#33,33, and 37) represent a conservative investment with little downside risk. Should Nigeria develop even a modest base of stamp collectors, it will soar.